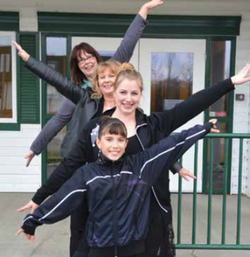 Six years of dance classes might enrich the life of a youth, but for a young Thorsby ballerina, hard work and focused passion will lead to an opportunity of a lifetime. Kiera Souza, who turned nine years old on October 17th, is a Grade 3 honour student at Thorsby Elementary School and a sixth year ballet student at Stageworks Academy for the Performing Arts in the City of Leduc. The big news in her life is that she has been recruited to appear in the Alberta Ballet’s December performance of The Nutcracker. At Stageworks, which she joined as a three year old, she is enrolled in ‘Turn, Jump & Stretch’, Classical Ballet and this year, Contemporary Ballet as well. Her teacher in all three classes is Genevieve Lemay, a talented instructor who is also the daughter of the Academy’s executive director, Darla Lemay. At a performance, Kiera was noticed by a principal of the Alberta Ballet. Through an email, she was invited to attend a free one-week ballet scholarship but her parents had to decline due to exciting summer travel plans. Later, she was invited to audition for The Nutcracker. Upon delivering her to the famous ballet headquarters in Edmonton, Carrie-Lynn and her husband, full of nervous anticipation and warning their young daughter not to get her hopes up, had to go away for a couple of hours and wait for a call to pick up their daughter. To their surprise, the call came one and a half hours early and upon arrival, Kiera excitedly announced to her parents, “I made it!” Kiera also expressed compassion and sadness for all the kids who were upset about not getting in. Kiera has always been fond of dresses and heels, often declining to wear track pants and jeans. Affectionately describing her as a, “little diva,” her mom adds that her daughter is also very talented in drawing, painting and pottery. She is a competitive athlete as well, having placed first in the last two years of track & field competition at her school. If parents feel that their youngsters have a passion for dancing and theatre and that they are ready for formal training, know that there are careers available out there. Stageworks Academy can always make room for new students. As for Kiera Souza, a word to our regional ballet fans out there: as soon as the tickets for the Alberta Ballet’s Nutcracker go on sale, plan to attend and watch our own Thorsby ballerina perform as the little mouse, in this classic performance that promises to be a memorable show.